Competition issues in the beef industry can be traced to the late 1880s and stemmed in part from market structure changes of an evolving economy. Railroads, improved highways, irrigated grain production, and technological changes within meatpacking plants combined over time to alter cattle feeding and marketing and the market structure of the U.S. meatpacking industry. Along the way, court decisions and Congressional actions altered the regulatory environment. Most notably, the Supreme Court issued the Packers’ Consent Decree in 1920 and Congress passed the Packers and Stockyards Act of 1921. The Act created the Packers and Stockyards Administration, now called the Grain Inspection, Packers and Stockyards Administration (GIPSA), within the U.S. Department of Agriculture (USDA). One might trace what could be referred to as the modern era controversy to the late 1960s when Iowa Beef Processors began to be a major force in the meatpacking industry. The technological innovation of boxed beef had a major effect on market structure and economics of the meatpacking industry. Since the late-1980s, concentration in meatpacking has been high by many economists’ standards, above levels considered by some economists to elicit noncompetitive behavior and result in adverse economic performance. This article focuses on the period since the 1970s. Its objectives are to: (1) put beef packing competition issues in historical perspective, (2) highlight market structure changes in beef packing, (3) note some key lawsuits and court rulings that contribute to the regulatory environment, and (4) acknowledge the large body of research related to concentration and competition issues. What led to high levels of concentration in beef packing? 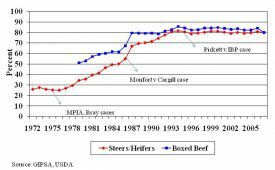 Here is a quick review of structural changes which occurred especially in the 1970s and 1980s in the beef packing industry. In 1976, there were 145 steer and heifer slaughtering plants with annual slaughter of 50,000 head or more (GIPSA, 2008 and previous annual reports). Some meatpacking firms own a single plant and some are multiplant firms. Plants with annual slaughter exceeding one-half million steers and heifers numbered five and accounted for 14.8% of slaughter by firms in the category of 50,000 head or more per year. Average slaughter in these largest five plants averaged 666,800 head. Comparable data for 2006, the last year data were reported, illustrate major market structure changes. The number of plants in the category of 50,000 head or more per year declined to 36. Fourteen plants each slaughtered one million or more steers and heifers in 2006. These 14 plants accounted for 70.2% of total steer and heifer slaughter in the 50,000 head or more size group. Average slaughter per plant in the 14 largest plants nearly doubled from 1976 to 1,302,643 head in 2006. The same trend can be identified for boxed beef processing plants. Not only did plant size increase, growth and consolidation resulted in larger beef packing firms as well, which in turn increased concentration. The four-firm concentration ratio (CR4), the combined market share of the four largest firms, is one common measure of how economically concentrated an industry or market is. In theory, the higher the CR4, meaning the closer it approaches 100%, the greater the likelihood the four largest firms are exercising market power. Market power may be either oligopolistic power of a few dominant sellers in the output market or oligopsonistic power of a few dominant buyers in the input market, reflecting significant influence on the market by a few firms. Economists have debated for years whether or not the CR4 is an appropriate or inappropriate measure of market power; but regardless, it continues to be a measure of concentration. In 1976 for steer and heifer slaughter, the four largest firms accounted for 25.1% of total steer and heifer slaughter (a CR4 of 25.1) according to GIPSA data. By 2007, CR4 was 80.0 for total steer and heifer slaughter as well as for boxed beef production. However, the four largest firms in 1976 were not the same as the four largest firms in 2007 due to several mergers and acquisitions. The sharp trend toward fewer and larger plants was driven by the enhanced economic efficiency and cost management associated with operating larger firms. MacDonald and Ollinger, (2005) cite technology combined with a sharp reduction in packer costs as contributing factors for consolidation in beef packing. Meatpacking is a margin-driven business. Firms buy livestock at a small range around the market average price. Meatpackers do not control the market average price; the result of price determination. Meatpackers do not directly control the supply of cattle raised and do not directly control demand by consumers for beef products. 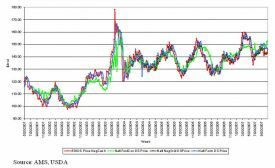 But packers can influence prices paid around that average price level; the result of price discovery. They subsequently sell meat and byproducts at a small range around the market average wholesale price. Again, they do not control the market average wholesale price but can influence prices received around that average price level. Thus, gross margins are about the same for all firms and the firm with the lowest costs experiences the largest net margin or profit. As a result, firms search for ways to control costs. Thus, one of the driving forces in market structure changes was the need to be a low-cost slaughterer and processor. Studies in the 1960s through the 2000s have found economies of size in cattle slaughtering and fabricating, and research confirms firms operate larger beef packing plants in order to be competitive (Ward, 2010). As noted by Ward, economies of size findings are quite robust across a variety of analytic approaches—economic engineering, simulation, and statistical cost analysis—and data—both cross-sectional and time series. Similarly, plant utilization significantly affects operating costs. Having a larger plant pays dividends in terms of potentially achieving lower costs per head. However, to realize that potential advantage over smaller plants, larger plants must operate at high levels of utilization. A larger plant at lower utilization rate may in fact have higher costs per unit than a smaller plant operated at near-capacity utilization. Research in the 1980s to 2000s also confirms the importance of plant utilization and that larger plants operate at higher plant utilization than smaller plants (Ward, 2010). Thus, larger plants have lower costs per unit than smaller plants both because they are larger and because they are operated at higher utilization. Plant operating behavior leads to dynamic structural changes. For example, when a firm expands a plant, say from one-half million cattle per year to one million cattle per year, either by expanding the plant or operating the plant two shifts per day, the plant experiences lower per-head operating costs. Importantly also, one-half million cattle previously slaughtered by other plants are now slaughtered in a single plant unless other factors intervene. Plants losing slaughter volume to the larger plant experience higher costs per unit because their plant utilization decreases. The result over time is that smaller plants experience higher costs and less profit, go out of business, and concentration in meatpacking increases. Again, research has confirmed this market structure dynamic. Market structure changes since the 1970s, including increased concentration, involved both firm consolidation as well as internal growth from capitalizing on plant economies. The industry evolved away from the old-line meatpacking firms that were household names for years, such as Swift, Armour, Wilson, and, Cudahy to firms like IBP, Excel, and, Swift Independent, and later to firms we have today, JBS, Tyson, and Cargill. Thus, concentration also increased from mergers and acquisitions involving the largest firms. The drive to operate larger, more efficient plants, capitalizing on economies of size, does not explain by itself the increase in firm size, such as via mergers and acquisitions. Little research is available to determine how many plants a firm needs to capitalize on economies of firm size. Advantages are assumed for multiplant firms in procuring livestock for several plants. Increasing pressures related to food safety suggest another advantage for multiplant firms and examples could be cited where single-plant firms experienced a food-safety crisis that led to the firm’s eventual demise. There also may be economies of scope available to firms that handle multiple meat species—beef, pork, and poultry—relative to firms that specialize in a single meat. Paul (2001) found evidence that larger and more diversified plants in terms of processing operations have greater technological economies than smaller plants. Another clear trend coincident with increasing concentration is increased packer procurement of livestock by non-cash-price means. The first year GIPSA collected data on contracting by the four largest beef packing firms (1988), forward contracts and marketing agreements—distinctly different but combined by GIPSA for reporting purposes—accounted for 15.8% of steer and heifer slaughter and packer ownership of fed cattle accounted for 4.7%. Considerably more and better data are available today on packer procurement methods as a result of the Livestock Mandatory Reporting Act. Beginning with its implementation in April 2001, data are now available on weekly prices and volumes of livestock procurement by alternative marketing methods (Ward, 2009a, 2009b). Alternative marketing arrangements for fed cattle include negotiated cash trades, negotiated grids—which specify prices for a range of price-quality combinations with the base price resulting from buyer-seller negotiation, formula priced trades typically with the base price tied to a cash market quote or plant average cost, forward contracts typically with price tied to the futures market or future market basis, and packer–owned transactions for which no price is reported since they are typically internal transfers from one division of the packing firm to another. The percentage of fed cattle purchased by packers through alternative methods has changed as follows over the 2002-2010 period since the new data have been reported. Negotiated cash went from 43.8% in 2001-02 to 34.1% in 2009-10; negotiated grid pricing, from 12.4% for 2004-05 when reporting began to 7.5%; formula agreements, from 48.9% to 43.0%; forward contracts, from 3.0% to 10.3%; and packer–owned, from 6.2% to 5.1%. Thus, there has been a trend away from the cash market and toward alternative marketing arrangements over the past decade. Figure 1 shows the variability in weekly fed cattle procurement by alternative procurement methods. Just as the extent of packer procurement of livestock by alternative methods is important, so is the relationship among prices by alternative methods. 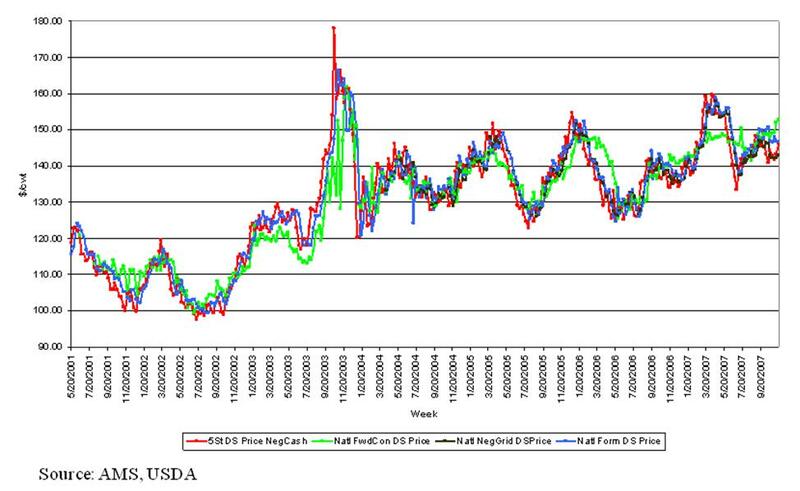 Figure 2 shows the weekly prices for fed cattle by procurement method. 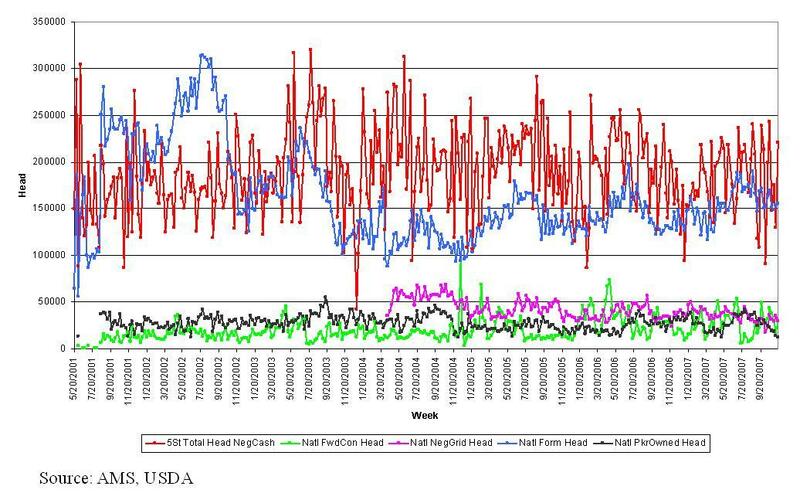 Prices for fed cattle track relatively closely for negotiated cash, negotiated grid, and formula agreements but forward contracts do not track the others as closely. The mechanics related to each method and the timing of reported prices for forward contracts explains many of the differences over time, but not necessarily for any given week (Ward, 2008). While concentration is high in meatpacking, civil antitrust lawsuits filed against the largest meatpacking firms have not resulted in major court decisions against those largest firms in the past thirty years. And no significant Federal government antitrust cases have been brought against the largest meatpacking firms over the same period. Civil antitrust lawsuits at three points in time seem relevant. Market power, oligopsonistic behavior, and price discovery were issues to some producers in the 1970s even though the CR4 in steer and heifer slaughtering was not high by economists’ standards. Two class action antitrust lawsuits, referred to as the Meat Price Investigators Association (MPIA) case and the Bray case, were filed against (in total) the four largest grocery retailers, four largest beef packers, and the leading private market reporting firm. The MPIA case was filed in 1975 when the CR4 in steer and heifer slaughtering was 25.3. After several years of litigation, both cases were dismissed in the early 1980s. A different type of lawsuit was filed in 1985 by Monfort of Colorado, then one of the largest beef packing firms, against Cargill which was a large competitor. Cargill agreed to purchase a competing beefpacker of both firms, Spencer Foods. Monfort deemed the acquisition anticompetitive both to itself and the industry, but the courts ruled in favor of Cargill and allowed the merger to proceed. The Monfort case was filed when CR4 in steer and heifer slaughtering was 50.2, and the court’s decision had a quick and lasting impact as it opened the door to several mergers and acquisitions involving some of the largest meatpacking firms. In 1987 alone, the CR4 in steer and heifer slaughter increased by 12 percentage points, from 55.1 to 67.1. By the mid-90s, the CR4 in steer and heifer slaughter had risen to about 80. Cattle producers filed a class action lawsuit against IBP in 1996, known initially as the Pickett v IBP case, and later called the Pickett v Tyson Fresh Meats case after Tyson purchased IBP in 2001. A jury in Federal court ruled in favor of the plaintiffs in 2004 and assessed damages of $1.28 billion. However, shortly thereafter, the trial judge set aside the jury ruling and entered a summary judgment in favor of Tyson which was later upheld by an Appellate court. These lawsuits are relevant for two reasons. 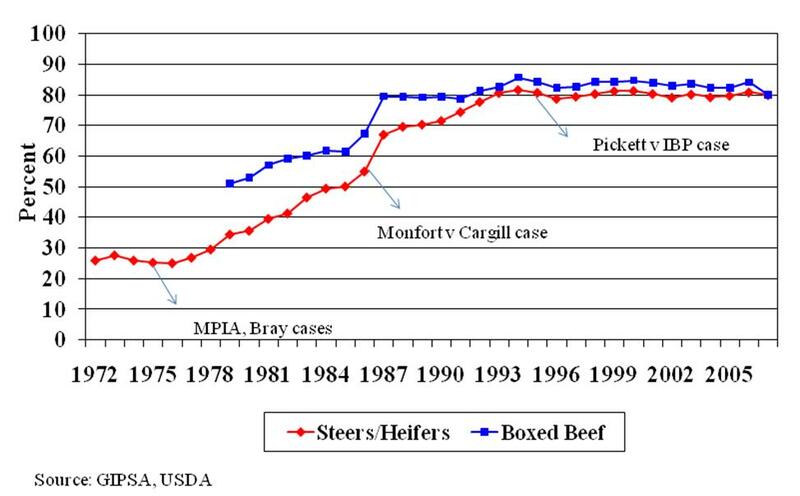 Figure 3 shows the reported CR4 in steer and heifer slaughter and boxed beef production since 1972 based on GIPSA data (GIPSA, 2008). In addition, filing dates of the three lawsuits are identified. Note the difference in concentration at each time period. Producers and competitors have been concerned about concentration and competition for many years, but to date insufficient evidence has been presented to rule in favor of those concerns. A reason for this relates to the mixed research results by economists, as noted later in this article. While regulatory agencies, notably GIPSA and the Department of Justice (DOJ) have been routinely criticized for not halting the trend in concentration, civil lawsuit outcomes may have influenced their decisions regarding potential antitrust regulation. Agricultural economists have conducted considerable research over the past three decades related to behavior and performance of livestock and meat markets, with considerable focus on the meatpacking industry. Ward (2010) reviewed a number of articles in roughly chronological order (see the review at the Department of Justice website http://www.justice.gov/atr/public/workshops/ag2010/index.htm#publiccomments ). Research varies widely in terms of data—data unit aggregation from individual transactions to annual observations, collection length from one month to decades, and spatial aggregation from local market to the entire United States—as well as methodological approach, including numerous econometric models, simulation, game theory, etc. An extensive review of competition in meatpacking concluded that the body of empirical evidence was insufficient to persuasively argue the meatpacking industry was not competitive (Azzam and Anderson, 1996). Sexton (2000) concluded that market power estimates in meatpacking are modest and structural changes on balance are probably beneficial from an efficiency viewpoint. Any single piece of research has its weaknesses in data and methodological approach, suggesting the need to consider the entire body of research. Two summary statements can be made from the Ward (2010) review. First, relatively consistent research on pre-committed—captive—supplies suggests use of alternative marketing arrangements by packers is associated with lower cash market prices for livestock though the magnitude of lower prices is quite small. However, research fails to connect this finding to abusive use of precommitted supplies. In the most recent Congressionally mandated study, economists found cost savings and quality improvement associated with meatpacking firms’ use of precommitted supplies, referred to in the study as alternative marketing arrangements, outweighed the effect of oligopsony market power (GIPSA Livestock and Meat Marketing Study, 2007). Second, research on oligopoly/oligopsony power is mixed (Ward, 2010). Game theory research provides evidence packer behavior is consistent with a trigger pricing strategy. Where market power has been found, whether oligopoly power or oligopsony power, the market power magnitude is relatively small in most cases and seemingly within an “acceptable” public policy level. But there are exceptions, and at least one study found a larger magnitude which exceeds the “acceptable” public policy level. Research on price impacts and market power estimates begs the question, “How large is large?” or “How small is small?” Price distortions of 3% or less have been found in several studies. These fall well short of regulatory agency standards related to merger impacts and noncompetitive behavior, often assuming a 5% price impact rule (U.S. Department of Justice and Federal Trade Commission, 1997). However, the courts and regulatory agencies have not defined specifically how much market power is “significant” and for how long a firm or firms must maintain significant market power. From a different perspective, seemingly small impacts in $/cwt can make a substantial difference to livestock producers and rival meatpacking firms operating at the margin of remaining viable or being forced to exit an industry. In relatively low-profit businesses, “small” degrees of market power can have significant profit implications. A major question relating to market structure changes and increasing concentration is what should be done or what can be done to reverse the trend? Some people want to do nothing and allow the marketplace to function unencumbered by external regulations and constraints. Other people would administratively alter the market structure where problems seemingly occur. For example, they would break up large meatpacking firms; and/or restrict presumed problematic behavior, such as eliminate contracting and vertical integration which includes packer ownership of livestock. No definitive answer is attempted here, but a few concluding observations are offered. From a long historical perspective, names of meatpacking firms change but many of the same allegations of meatpacker abuse continue. Evidence of structural changes is clear. Meatpacking firms have increased greatly in size both from internal growth as well as mergers and acquisitions. The result has been fewer and larger plants, fewer and larger firms, and much higher levels of concentration. Evidence of behavioral changes is clear also. Meatpacking firms no longer rely solely on the cash market for livestock purchases. These changes are in response to livestock owners’ preferences as well as the need for improved coordination and reduced costs to be competitive with rival firms and for beef to compete with other meats. Lastly, research findings do not consistently and convincingly identify serious problems, though many studies point to potential problems and raise several issues. Determining the need for legislative or regulatory reform is difficult, as is identifying what the reform measures should be that would be corrective, without being disruptive and injecting unintended, negative consequences onto the marketplace. Azzam, A., and Anderson, D. (1996, May). Assessing competition in meatpacking: Economic history, theory, and evidence. GIPSA-RR 966. GIPSA (Grain Inspection, Packers and Stockyards Administration). (2008, May). 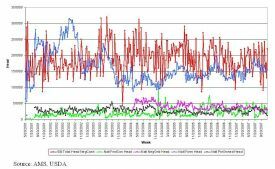 Packers and stockyards statistical report: 2006 reporting year. U.S. Department of Agriculture, SR-08-1. GIPSA Livestock and Meat Marketing Study. (2007, January). Volume 1: Executive summary and overview final report. Research Triangle Park, NC: RTI International. MacDonald, J.M., and Ollinger, M.E. (2005). Technology, labor wars, and producer dynamics: Explaining consolidation in beefpacking. American Journal of Agricultural Economics 87(4), 1020-1033. Nicholls, W.H. (1940). Market-sharing in the packing industry. Journal of Political Economy 22, 225-240. Paul, C.J.M. (2001). Market and cost structure in the U.S. beef packing industry: A plant-level analysis. American Journal of Agricultural Economics 83(1), 64-76. Sexton, R.J. (2000). Industrialization and consolidation in the U.S. food sector: Implications for competition and welfare. American Journal of Agricultural Economics 82(5), 1087-1104. U.S. Department of Justice and Federal Trade Commission. (1997, April 8). Horizontal merger guidelines. Washington, D.C., Issued April 2, 1992. Revised April 8, 1997. Clement E. Ward (clement.ward@okstate.edu) is Professor Emeritus, Department of Agricultural Economics, Oklahoma State University, Stillwater, Oklahoma.